TheWirk.com ~ voted BallHyped.com's 2010 "Best Independent Sports Blog": It's tough to be a Celtics or Hornets fan right now ~ Go Cavs, Go Caps, Go Colts!!! It's tough to be a Celtics or Hornets fan right now ~ Go Cavs, Go Caps, Go Colts!!! 1. 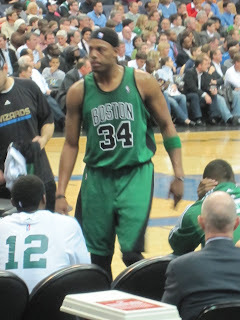 Wouldn't be surprised if Paul Pierce sits out a few games. Might as well rest the foot/ankle, until after All-Star break. 2. Ray Allen to be traded? I think it's a mistake. 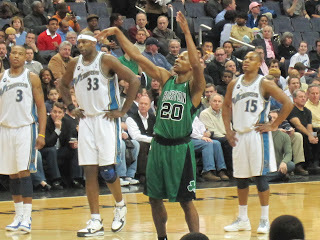 I like Ray Allen as a Celtic and his 3 point prowess... He's the Celtics version of John Starks... I like his 3P%age (about 33 percent) and his 15 PPG. Admittedly, I'm not a GM so I have no idea what he's making. What uniform do you see Ray Allen wearing? 3. Would hate to be a Celtics fan right now, with all these headaches and KG back in the game. 4. Celtics don't scare Cavs fans! 6. Incidentally I was playing on Twitter and saw NBATVChris (aka Chris Webber) ask if anyone thought Memphis was going to beat the Cavs last night... I tweeted back that there would be no upset in Cleveland and that the Cavs would win. Chris, I was right! 7. Chris Paul to have surgery. That's really unfortunate for him and the NO Hornets, who currently are in the 9th spot in the West. Sorry Hornets fans... There's room for you on the Cavs bandwagon... We'll welcome you with open arms. Hornets don't scare Cavs fans either! 8. NBA-All Star next weekend in Dallas ~ I need to start planning my trip!!! 1. 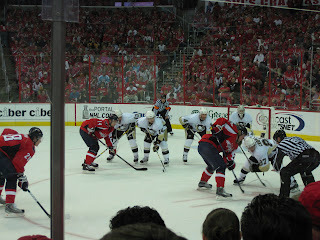 Capitals have won 11 in a row, but I won't be able to check them out until March. They're away A LOT this month and I'm headed to the Super Bowl this weekend. 3. Whoever is in charge of setting NHL hockey schedule needs to get fired. Why would you have the Capitals play the Penguins on Super Bowl Sunday?!?! It makes no sense and at a minimum completely inconveniences ME, since I would've liked to have been there in-person to see the match-up at the Verizon Center! Seriously, the first time these 2 teams met this year (last month), they were up against the Lakers v the Cavs in Cleveland. I remember that, because I was in Cleveland watching LeBron et al ball... I have no idea what cave the NHL schedulers are hanging out in ~ but I hope they get their acts together and position the marquee matchups better next year. 1. Dwight Freeney will play. He has to... It's the Super Bowl. GO COLTS!! !